Testimonials are sometimes edited for clarity and length. Sorry, we are too busy producing rootbeer this year to update our testimonials page. We're dog-wild you like our rootbeer so much! Subject: Simply the best root beer. A friend gave me a Bottle of Bulldog and I went and bought the last 2 six packs at my world market here in San Antonio. Simply the best root beer I have ever tasted. Keep up the good work and I'll keep buying it. I have a huge Superbowl Party coming up. Got a Keg ? Editor's Note: Sorry no draft root beer. Bottles only. Thanks for your support! Just want to say how much I like your product. It IS the BEST rootbeer I've ever tasted, and one of the best looking labels I've seen. 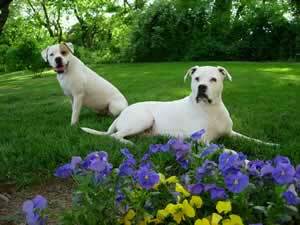 I am an AB (American Bulldog) enthusiast/bulldogger myself, being that I own 2 AB's. (You just can't help loving these dogs). I'm always looking for new AB products and am glad I ran across yours. I have shared it with my friends and other bulldog lovers, and will continue to do so. Keep up the excellent work. Editor's Note: Sorry no merchandise yet. Hopefully someday we'll have a fully stocked merchandise page where you can order all sorts of neat Bulldog stuff. Subject: My Friends Want MY Bulldog Root Beer. I am writing to let you know that you have earned a new fan and customer of Bulldog root beer. Recently, a World Market opened in Greenville, SC and I went there to check out their new store. While browsing, I came across the soda section and saw an interesting 6-pack of root beer that feature bulldogs on the bottle. I bought a 6-pack on impulse. The next night, I opened my first bottle of Bulldog root beer and all I can say is WOW! I have never had a root beer that tasted so good in my life. Sure enough, I finished my six-pack of Bulldog Root beer in one day. A week later, I returned to World Market to purchase some more and they were out of stock. I spoke with a manager and he assured me that another case was on order. The following week it was back in stock and guess what? I bought the whole case! I had a get together on Saturday for a college football game on TV. My friends tried out your Bulldog Root beer and they all loved it. We finished that one case in 2 hours! Now, I have friends that want to come over and have MY Bulldog root beer. Subject: Best Root Beer so far. I recently purchase my 1st bottle of BullDog Rootbeer at Galco's in Los Angeles, Calif. I purchased it because of the picture of the BullDogs on the label. I know not all rootbeers taste alike, and I am always open to try a new one. But, I wasn't planning to drink this one 'cause I wanted to save the un-opened bottle. I love pictures of dogs, and a picture of two dogs on a glass rootbeer bottle was just too cool. So one day, after being really thristy and not finding a Pop in the refrigerator to drink except the Bulldog, I gave in to the temptation. And boy, was I glad I did. I have Never, had a rootbeer like this... I shared it with my daughter and son (as we always do with glass-bottle soda, such a treat) and my daughter mentioned that it tasted like vanilla. So, I checked out the label to look at the ingredients, and she was right. Cane Sugar, Honey, Vanilla, to name a few of the ingredients: Wow! What a combination. This definitely is the best rootbeer on the market. I also noticed the web address on the label. So here I am online, seaching for a store closer to me to purchase some more. I found one store. Cool, I am going root beer shopping tomorrow. Subject: Reminiscing about Root Beer & American Bulldogs. I was in Eyler, Maryland, for an American Bulldog Show this past weekend and saw your rootbeer at Chubby's BBQ Restaurant. I looked at a bottle, saw the two AB's on the label and I flipped out. I had to have that bottle, and I love root beer anyway, so I was excited to try it. I drank it back in my hotel room, and it was like drinking root beer silk. So smooth and light but with a lot of depth and delicate flavors of honey, cane sugar and vanilla, and not too much carbonation to distract from the experience. This is the best root beer I've ever had! I used to drink Hires© root beer when I was a kid, and every Friday I'd ride my bike up to the gas station to get a pizza steak, a Suzy-Q, and a glass bottle of Hires, then ride home for the feast. I remember one hot day looking at the bottle of root beer in my basket and it was sweating as much as I was. I couldn't wait to get home, so I stopped and drank it right there. That was the last time I had a Hires root beer in a bottle, and it's my best memory ever! Now that they don't make Hires in glass bottles anymore, I long for my Friday root beer. Thank you for reviving a long lost right-of-passage for me. I raise and show American Bulldogs now, and I would love to put your logo and link on my website, www.americanbulldogsnj.com. P.S. 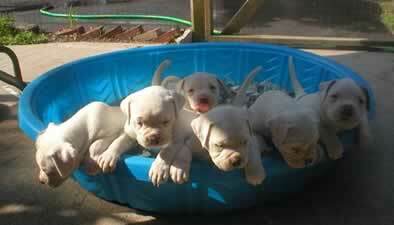 Here is a picture of our puppies. I love these dogs! Editor's Note: Sorry no merchandise yet. Hopefully someday we'll have a fully stocked merchandise page where you can order t-shirts and all sorts of neat Bulldog stuff. We just had our first Bulldog Rootbeer floats and they were fantastic! Subject: Remembering Homebrewed Root Beer. I read your story about making Hires Root Beer on your Root Beer History page. When I was a little girl, the local Hires plant went out of production and we bought up tons of the extract using it throughout the years even when the extract had coagulated. Some of my fondest memories are of doubling the amount of yeast. My dad always said it was because the house was a little cold but fact was he missed drinking beer. In our pantry that was heated by the water heater we quickly discovered our need to monitor the root beer constantly to avoid exploding bottles. I wanted to thank you in advance for providing a product that does not use corn syrup to sweeten the product. Through an allergy group online, I have learned the taste and quality differences when cane sugar is used instead. Cant wait to find Bulldog and ship it to my dad. At +70 he still races motorcycles and will love to have a beverage to show off to all of his beer drinking mates! Subject: The Bulldog Biker Babe Strikes Back. 1. I am a die-hard root beer, sarasparilla, and cream soda fan. 2. I am a die hard, loyal, won't ever have another breed bulldog owner. Here's a shot of my boy, Halsey. He's kinda old. Subject: Bulldog Doesn't Bite Back. Yes, I do like Bulldog Rootbeer! For one thing, it doesn't bite back. Any chance of coming out with a Bulldog Rootbeer Tee Shirt? Editor's Note: Sorry no t-shirts yet. Hopefully someday we'll have a fully stocked merchandise page where you can order all sorts of neat Bulldog stuff. Subject: Bully for Bulldog in Pennsylvania. I bought your root beer simply for the name and the picture on the label. I have two American Bulldogs, and I just had to buy it when I saw it. I do like root beer once in a while, but I really didn't mind if yours tasted good or bad - I just wanted the bottles. Well, I drank my first Bulldog Root Beer today and I have to say it is the best root beer I have ever tasted. It's so sweet and yummy, I love it! We have a Labor Day party every year, and I am going to get tons of Bulldog root beer for our party. I can't wait to share it with all our family and friends! Let me just say I am only 14, and even I can tell that if you want creamy, thick, flavor-charged rootbeer, you want Bulldog. It is better than all those other national brands: they actually care about the product and quality we recieve, not the amount shipped out or something like that! Subject: Bulldog fan in Littleton, Colorado. A little over a month ago, I had the distinct pleasure of sampling Bulldog Root Beer and can honestly say that there is nothing else quite like it. This beckoning blend of cane sugar, honey, vanilla and aromatics won me over after the first bottle. Ever since, Ive done whatever I could to ensure that I have enough Bulldog waiting for me after a long day at the office. Subject: We love Bulldog in Illinois. I just wanted to let you know how much I enjoy Bulldog Rootbeer. Rootbeer has always been my favorite drink and now I have found my favorite Rootbeer. I live in Morton Illinois which is close to Peoria. Fortunately, Bloomington Illinois has a World Market Store and they call me when they receive Bulldog. I always purchase four six packs at a time. My first case I had to drive to Champaign Illinois which is about 80 miles away and even at that it was worth it. Whenever I am in St Louis I always hit the World Market Stores there and on my last trip I purchased three cases. It took two stores to accomplish this. You have a fabulous product and I hope that someday I will be able to purchase it in Peoria Illinois. 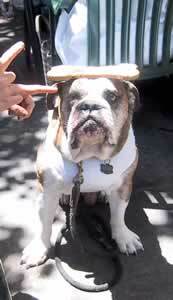 I'm sure that most of the people who write in about Bulldog consider themselves experts and I am no exception. However, it doesn't take an expert to know that Bulldog is NUMBER ONE. Subject: From your biggest fan! I truly adore your root beer it is my absolute FAVORITE thing! I am 10 years old and I just want to say thank you for making such an exquisite drink. None of my friends need to ask what drink is my favorite because they know that it is "Bulldog" root beer! I dont know why, but I only seem to like Bulldog root beer; none other. My dad once got different ones to see which one I liked, and I just seemed to like yours the BEST! I just finished the History of Rootbeer on your website and wanted to add my testimony to your list. I have a rootbeer collection of over 40 different brands and it is displayed on top of my kitchen cabinets. I have bottles from all parts of the US from the East Coast to the West Coast and everywhere in between. Rootbeer has always been my favorite "soda" for as long as I can remember. I will have to say that Bulldog is my favorite and is hard to get here in Southern Illinois. My employees at Applebee's bring me rootbeer whenever they go somewhere or come home from school because you can only get certain rootbeers from certain places without having them shipped in. I can testify that each one does taste different with some having a more distinct flavor than others. What I like best about Bulldog is its smooth, rich taste. There is not so much carbonation that it burns when it goes down. Pure cane sugar and honey are definite ingredients in any good rootbeer. Thanks so much for making the best rootbeer that I have tasted. I would be glad to answer any questions or be of service if I could. I'm a bit of a root beer connoisseur, and I think I have found the best I have ever had with your root beer. I absolutely love it. Wow! I bought a six pack of your root beer because of the label. The root beer is terrific. 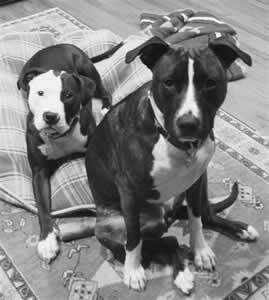 Our bullies, Duce and Piper (photo attached), would like to send greetings to Barley and Hops. They are gorgeous! Subject: Enjoyed your root beer history lesson... BRAVO!!! I really enjoyed your very informative piece on the origins of root beer. I always wanted the "scoop," on how, where and what the complete deal was with root beer. My late father truly enjoyed root beer. In fact he had an old ceramic mug from "Mug Root Beer," that we as kids washed and carefully placed on the shelves for our dad's next sitting. Very informative, soothing and I'm leaving right this moment to purchase a 6-pack of BULLDOG!!! If there's anything I can do for you guys from here in Santa Rosa, California (Approx. fifty miles north of San Francisco) please don't hesitate to ask. I participated in this Breakdance event. After a long run of breakdancing I was extremely thirsty so I went to get some drinks at a local grocery store. I noticed a 6-pack of Bulldog Root Beer, grabbed it. And immediately drank it and I'd have to say this is the best drink I've ever had. Once we popped the caps, I gave it a sniff and was amazed and all excited. As soon as I took the first chug, I was in Nirvana. Well, cheers to Bulldog Brewing! Subject: I need my root beer fix. I am down to my last 6 pack of Bulldog root beer, it is awesome! It also works as an aphrodisiac, I had my ex-girlfriend over for root beer floats on Saturday night before the Knicks game. We never made it to the game and are back together.